Old Moor Street in Pettah will probably never change. It's dirty, overcrowded and always a hive of activity. But the Natamies who literally carry the weight of the thriving business, are a dying breed. But they are determined to change their lot before that and have asked for a 'little more'. Businessmen jostle with Natamies (labourers), pushing carts or carrying bulky gunny bags over their shoulders; small-time traders look for bargains; workers idle on street corners or outside shop doors smoking beedis or engaged in aimless conversation as they wait for work. This is Old Moor Street in the heart of Colombo's business district - alive, noisy and dirty but buzzing with activity. Goats stroll around, joining some cows looking for food in dirt bins, which pile up on street corners. Drains are filthy. There are puddles of water all over - though there hasn't been any rain recently. The water is probably overflowing from a drain somewhere down this long and dusty street. Old Moor Street lives up to its character - old, untouched, overcrowded and dirty by nature. But this is where Colombo's wholesale and retail trade goes on - the hub of the wholesale rice, spices and commodities market. Business worth millions of rupees - by some accounts more than 300 million rupees - is transacted daily. Many traders work in comfortable air-conditioned rooms surrounded by modern technology like fixed telephones, fax machines and mobile phones. The facade of their shops, however look dusty, old and unkempt. For centuries this street, like many of its dirty cousins in the neighbourhood - Fifth Cross Street, Fourth Cross Street and Dam Street - has lived up to its name of the hard work-make money-go home routine, for its 3,000-odd traders and workers. There has been little dissent or dispute between the two until the unthinkable happened last week. The Natamies - about 1,000 of them working down Old Moor Street - went on strike, demanding better rates for their hard labour. The effect was stunning, for rarely have these labourers - many of whom are Tamils of Indian origin, born and raised in tea estates in the central region - rebelled against their "masters". They have always been content with the meagre money they make after a long day and rarely complained until things got difficult this time. "We are in a desperate plight. The cost of living is unbearable and we have not had an increase in our rates since 1996," said 30-year-old Michael Paul, a young Natami with three school-going children, who led the protest campaign. "Our families are asking for more. So what are we to do?" he asked. Often requests for an increase in wages or daily rates, annually or once in three years, are generally agreed to by the traders without a fuss. This time round, however, the request - made about two months ago - was not looked into immediately in view of Presidential elections and the Christmas and New Year holidays. "I don't see any problem in resolving this issue," says Palaniyandy Sunderam, President of the Old Moor Street Traders' Association, who started life as a tea boy when just nine years old. "If these Natamies had given us adequate time we could have amicably sorted the matter," the now-wealthy trader told The Sunday Times from his posh second-floor office. The Natamies had issued a notice to some 300-odd shops down the street appealing for higher rates for loading and unloading bags from January 1. Traders received the notice on December 30 but chose to ignore the appeal. They were in for a surprise on Tuesday, January 4. As shops opened as usual by around 7 a.m. lorries lined up outside shop doors and traders prepared for the usually busy day ahead, the Natamies - a vital cog in the wheel of business in Pettah - were missing. They were on strike. As the hours slowly ticked by and more and more lorries queued up, traders panicked. Sunderam's office phones were ringing constantly as traders asked him to intervene. Sunderam summoned a meeting of traders and Natamies at 10.30 a.m. where - after a lot of shouting and arguments - it was decided that the traders would negotiate a settlement and offer new rates in 10 days. "I promised the Natamies that we would look favourably into their demands. They were satisfied and went back to work by one in the afternoon," Sunderam said. The Natamies receive rates ranging from one rupee for loading or unloading a 10-kilo bag to 3.50 rupees for loading or unloading a 50-kilo bag. They are demanding revised rates with the one rupee figure going up to two rupees and the 3.50-rupee rate going up to seven rupees. Traders lost millions of rupees worth of business due to the lightning strike. Though the Natamies were unable to get immediate relief, they proved a vital point - their importance in the Pettah economy and that their demands in the future would be given top priority. "We also lost money, but we had to do something to draw attention," asserted Paul. A Natami colleague, Devasagar Sami, 58 years - one of the oldest coolies down the street - reluctantly went along with the strike action. "We could have used other ways of ensuring traders raise our rates," he grumbed but agreed that the strike made traders sit up and take notice of the Natamies' important link in the Pettah trade. Paul and Sami belong to a breed of workers who have struggled through life on the streets of Pettah to earn a pittance, like their fathers and forefathers who all did this menial job of loading and unloading bags from lorries with the help of the curved steel hook, over the past few centuries. Their day starts at 6 a.m. and ends at 7 p.m. 10 p.m. or sometimes 12 midnight depending on the availability of work. Average earnings are in the region of anything between 100 rupees and 300 rupees a day and food for the home is purchased at the end of the day with the money. A little money is left over for a drink - a quarter bottle of arrack or hooch if the cash runs out. But one thing seems certain - Natamies are a dying breed in Sri Lanka and the current lot would probably be the last of the Natami generation in Pettah and perhaps across Sri Lanka to serve the nation with their bare, calloused hands. Both Paul and Sami agree that their children - unlike during the days of their forefathers - would not carry on the Natami tradition. Paul, like many other Natami families lives in small shantytowns spread around Pettah. His children go to a nearby convent school and he proudly says they are good in their studies. 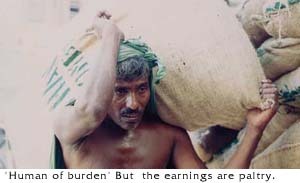 Sunderam says: "Paul's and Sami's children are not going to do the same street jobs. Things are changing nowadays and like the children of estate labourers, who are seeking jobs out of the estates, these children also want to do something different." Sunderam says traders may have to look at different options in the future of loading and unloading bags into lorries or go-downs. "Whoever thought I would have a mobile phone and a fax machine. Things are changing and I see this change happening in Old Moor Street too." So if ever you happen to walk down the crowded streets of Pettah's bustling wholesale and retail trade, take a close look, even a second look at the sweaty Natami ... for that would probably be your last glimpse of them this century! It is the typical rags to riches story - straight out of a Dickensian novel. Palaniyandy Sunderam came to Colombo as a 13-year-old in 1963 believing that the city's streets were paved with gold. Working as a tea boy in a shop down Old Moor Street, Sunderam was determined to move on and make his fortune in Colombo. "I may have not studied. But I wanted a better life. I was determined to work hard for it," he said comfortably ensconced in an air-conditioned second-floor office surrounded with the technology of any classy businessman - three telephones, a fax machine and a sleek mobile phone resting on a well-polished desk. The beginnings were however tough for Sunderam, son of a tea plucking-couple at Craig estate in Bandarawela. Growing up amongst line rooms and dirty toilets, Sunderam - unlike other boys of his age - wanted to study and do something different in life. The sons and daughters of estate workers traditionally joined their parents on the field when they grew up. When he was nine years old, Sunderam walked into St. Mary's Convent - a school about 16 miles away from his village - and pleaded with the Mother Superior to admit him. "I remember crying and asking her to take me in. I really wanted to study. I wanted to learn English," the 51-year-old businessman recalled with emotion. After much persuasion, he was admitted to grade one as a nine year-old - with no previous education - while others in the same class were only six years. Since the 16-mile walk from his village to school would have been tiresome for a nine - year-old, Sunderam approached a grocery shop near the school and offered to work for free in return for food and a place to stay. It was a busy period for the lad - getting up at 4 in the morning, working till 7 a.m. and then leaving for school. Returning to the shop at 1 p.m., he worked till late night, stacking and clearing shelves with goods. After reaching grade five, the shop owner put pressure on Sunderam to work full-time in the shop, but after a dispute with the man, the young lad took a bus to Pettah where he landed a job in a shop for a salary of 10 rupees a month. His job was serving tea to other senior workers, working as a peon and delivering letters. "I was keen to study English so that I could move on. But I was unable to do this as my salary was insufficient," Sunderam said. After about two years, Sunderam decided to venture out on his own and bought and sold pens and wristwatch straps, travelling the length and breadth of Sri Lanka selling this stuff. From there he moved on to selling potatoes and onions at the Jathika Pola, and collecting paddy husk and selling them to the Oil and Fats Corporation at Seeduwa for the manufacture of animal feed. The days were hard and tough and he often slept under lorries at night. By sheer dint of hard work and determination, Sunderam collected enough money to buy his current shop for Rs. 250,000 in 1975. Sunderam has three grown-up children - two boys and a girl. His eldest 27-year-old son is helping in the family business while his 24-year-old daughter is his personal secretary and planning to get married soon. His 21-year-old son is studying in Australia. The former tea boy laments the lack of interest in municipal authorities to maintain and develop Old Moor Street and its surrounding areas. The Old Moor Street Traders' Association, of which Sunderam is the president, has appealed to the authorities to do something, but the appeal has fallen on deaf ears. Now the traders are threatening - in a letter to the municipality last month - to withhold the payment of municipal taxes and other dues if the street is not maintained. "We pay good money to the authorities - I pay Rs.100,000 a year in municipal taxes alone - but the street remains as it was decades ago," Sunderam said. Like many other traders down the street, who have had similar humble beginnings, Sunderam now hobnobs with business colleagues, Natamies and the elite in society. "I can now go to a five-star hotel in the evening and have a drink with my friends. Whoever thought I could come this far in life," he said, with a smile.